Click on the Rhinoceros image above and move your mouse over the 3D movie to see the interaction take effect. You may be in for a pleasant surprise. The environment looks so real and the navigation speed / performance is pretty good too. 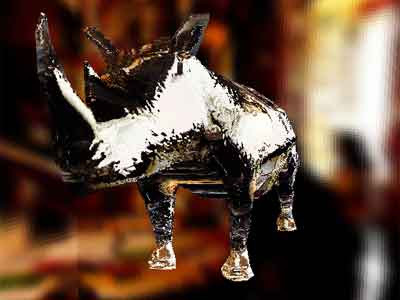 The above 3D Rhinoceros scene was created using Papervision3D. We are used to watching City Panoramas in Apple Quicktime player but with such amazing 3D technology in place, Adobe Flash Player can definitely be a worthy contender. Wish they had a created a similar 3D Flash environment for that Macworld scene when people were crowding near the iPhone model which was kept inside the glass casing.